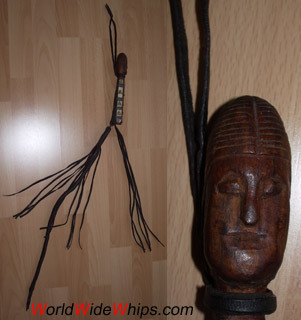 This riding whip seems to be not very old, as it contains modern materials like zinc-plated wire and hand-carved plastic applications. It has a single thong made of several layers of leather, sewn together and then rounded. Narrow strips of leather are set around the thong like a fringe. Five additional strips have a separate fixture. Maybe the rider had the option to fold back the main thong and use the sets of strips as a milder whip.